William at Stages Theatre — for the First Time! I am honored to have another guest today. You had a teaser for this story yesterday, in Jennifer Kirkeby’s post about adapting Anna Dewdney’s Llama Llama Red Pajama as a stage musical. Today you get to read the story in its entirety. It was William’s first trip to Stages Theatre. Just four years old my little neighbor has a great imagination, an inquisitive nature, and boundless energy. Mom & Dad have read to him since he was born – but this time the characters would come alive. How would William react to Stages Theatre production of Llama Llama Red Pajama? His mom Kari, William & I arrived at Stages early that Sunday afternoon. (Dad was on a business trip and unable to join us.) We picked up our programs, a bright yellow booster seat and proceeded to our seats. Watching other families arrive took up some of the waiting time – but William was anxious for the play to begin. We busied ourselves with the printed program – where William quickly discovered the glue dots that affixed a bookmark to the program! At last the play started. William sat bolt upright in his booster seat – watching intently as the Baby and Mama Llamas danced and sang. There was so much to watch! The stage set was bright and colorful – there were beds for each baby Llama along with matching nightlights – even a star-filled background. All his senses were engaged as the actors danced, sang and pranced across the stage. I’m sure his imagination was working overtime – as these two-legged llamas were very different from the four-legged llamas in the book. After fifty minutes of dancing, singing and dialogue – the play was over. As the crowd filtered out we stayed to explore the theater. We took a closer look at the stage – and saw where the actors had entered. And as I turned around I pointed out all the seats and explained that was where the audience sat. William looked up at me and asked – “What does audience mean?” We checked the lights and the balcony. As we left the theater I explained to William that now he could stand in line and all the actors would autograph his program. Clutching his program – he patiently waited as each actor signed his program. At the end – one of the Mama Llamas knelt next to him as William told her – “I really liked your dancing”. It was the perfect ending to a wonderful afternoon! He will long remember the songs, dancing and the actors who greeted him and signed his program. Days later he was still talking about his experience. William’s favorite Baby Llama? The one who was golfing – as he loves golfing. A wonderful introduction to the magic of theater that is Stages. If you have a young one in your life – please share the wonder of Stages. 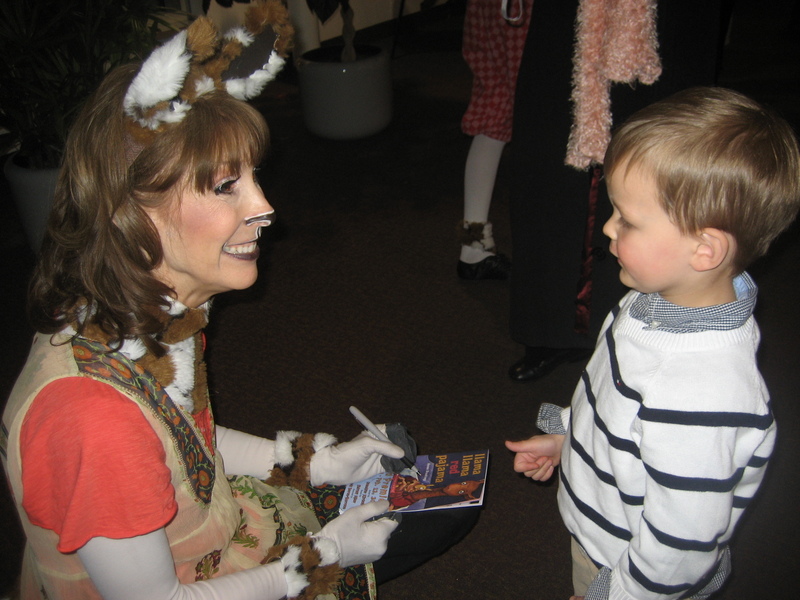 Llama Llama Red Pajama is over – but upcoming productions include The Secret Garden (March 2- March 18) followed by Giggle, Giggle Quack (April 13 – May 13). Stages Theatre Company is located in the Hopkins Center for the Arts in Downtown Hopkins. Now in their twenty-ninth year they are committed to the enrichment and education of children and youth through theater production and workshops. Stages is Minnesota’s leading provider of theatre arts programming – serving more than 125,000 people annually through performances, education and school outreach programs. For more information check out their website at www.stagestheatre.org. Photos by Bruce Challgren, photopixels.com. Used by permission. Please do not copy. Thanks, Erik! Oh — “If You Give a Pig a Pancake” would be such fun to see on stage! I’m so glad you enjoyed reading about this production. Introducing the arts to children early on is wonderful. In this instance, young William got a chance to see the written word come to life right before his very excited eyes. How delightful. Isn’t it fun to see the production through William’s eyes? I am so grateful that Nora allowed me to reprint this delightful article. Beth, this was the perfect ending to the 3-day post. I loved it ending with William’s experience of the production. Sounds like he had a ball. I am such a big proponent of taking kids to shows like this. Fortunately I live in a city that has a program for young kids from fall to spring at the Victoria Theater. Thank you, Pat! When I read William’s story, I knew I just had to share it — it’s so delightful! I’m grateful to Nora, and to William’s Mom, for letting me reprint the story here. You are very fortunate to have access to a theatre like that!